Please Note:This image is just a representation, so sorry but the AD placement is NOT at the right location. They'll most likely be tighter together. 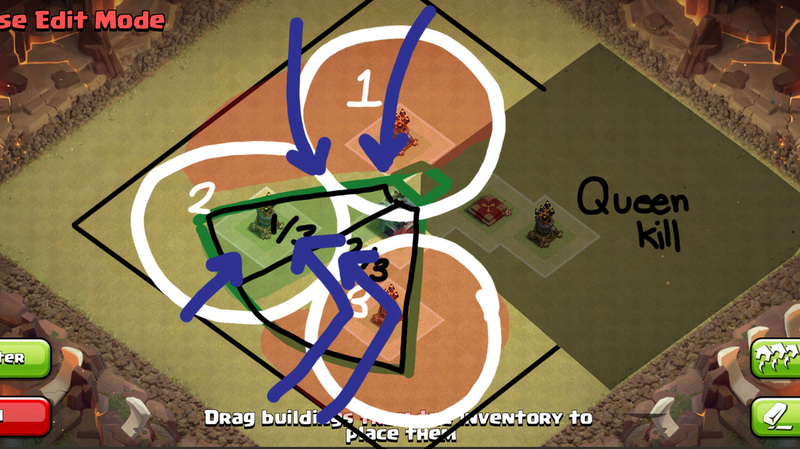 Protecting Two ADs can only be utilized if the out of the 3 elements of Air Sweeper, the Back side MUST be protect since the fact that the Air Sweeper will be located at this section. Please Note: The speed/timing of this .gif animation is NOT accurate to how it would actually play out in the game, due to the milliseconds of difference and timing of which rage spell, travel time, and charge up delays which each troop/Air sweeper's push distance plays into effect. If you look at this animation to the left, you can see that since the fact that the Air Sweeper only targets the first lava (on the left), the other side (right) of the base will not be protected at all. This follows the same issues with having a centralized AD since the fact that you lose that 2/3s of a protect, and what's even worse is the 2/3s of the base is a 'core' territory. 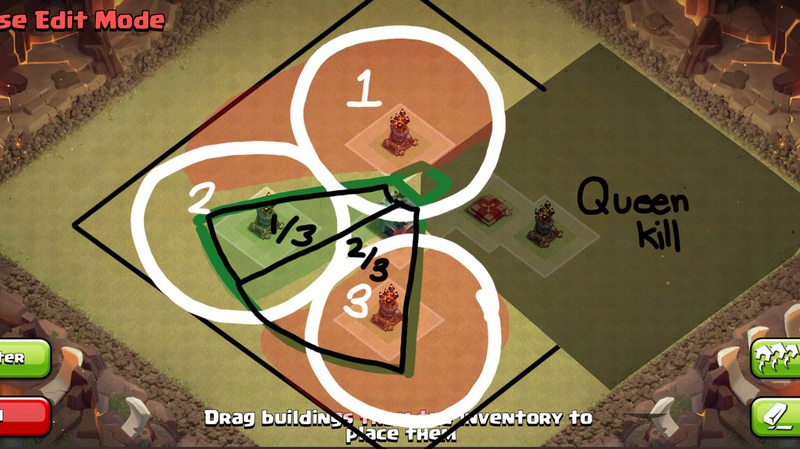 In this image shown, It shows the 3 "territories" of this base. Due to the fact that each Air Defense has it's own Territory and coverage, the Air Sweeper trying to cover all of them isn't a good solution. The Air Sweeper is vulnerable from behind which can easily be killed from the 1 Territory, as well as the fact that Territory #3 is not protected by the Air Sweeper due to the fact that the Air Sweeper is focused on the Lava hound at Territory #2. In this set up, it's clear that the enemy has the option of going a counter clockwise to kill the AS right from the beginning since it's within the First white Territory. If not, they can over power the AD on Territory #3 since it's not being well covered by the AS. In both cases, although inconvenient compared to the typical Penta, or Clockwork styles of Lavaloon, it's something that will be caught up with when it comes to attacking sooner or later. As of now, I there aren't really too good of solution towards this set up due the fact how easily it is to bypass this AS from the back side, or just plow right through it. 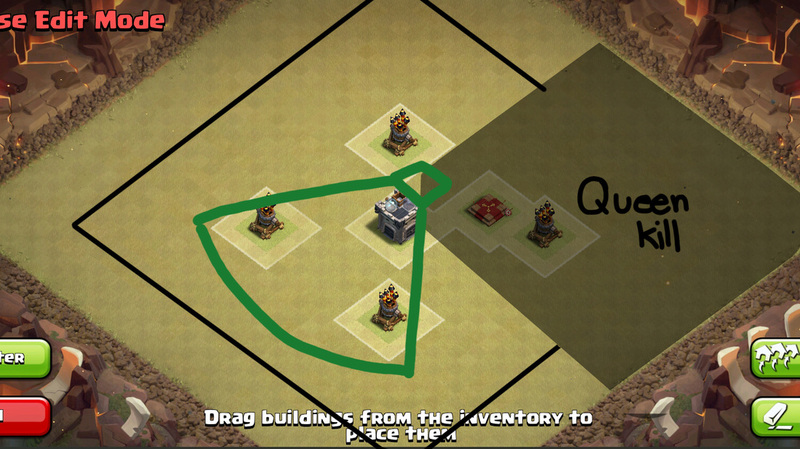 The best solution would be to protect that First Territory behind the AS as much as possible, but highly unlikely due to the Queen killing section, or make the area around the queen Kill section be Anti-loon section.